Jorge Pomareda is a Mexican-Peruvian graphic designer, residing in Chicago. He grew up in Costa Rica, where he started his career in advertising and design. Later he moved to Italy to study at Scuola Politecnica di Design in Milan. His work has been featured in Print Magazine’s European Design Annual, Communication Arts and the British Design and Art Directors Annual. 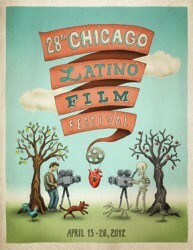 “For the Chicago Latino Film Festival, I wanted to make a poster that would be visually interesting, but that would also tell a story. I choose the heart as a symbol of passion… passion that goes into making films and the passion that films generate in viewers. The heart is linked to the film like a machine because they keep each other going.